Three miners explored the Yellowstone region and realized the need of preserving the area from commercialization. After returning from their expedition, Charles Cook and David Folsom wrote articles about the abundant wildlife, boiling pools, gushing geysers, waterfalls, rivers, and a natural fish cooking cone at the shore of Yellowstone Lake. However, reputable magazines refused to publish what they considered unreliable stories. In 1869, Ferdinand V. Hayden, head of the U.S. government’s new geological commission assembled geologists, botanists, and zoologists, as well as artist Thomas Moran and photographer William H. Jackson, to assess the area. The wonders and natural beauty stunned the party. Moran’s watercolors and Jackson’s photographs proved the wonders others had dismissed. Hayden made a 500-page report to Congress, and the lobbying to make Yellowstone a national park began. In the Lake General Store hangs a July 28, 1871 photo of Annie, the boat used by the Hayden Expedition and believed to be the first European boat ever to sail on the lake. The men made their way around the shoreline, measuring and sketching maps. Their work with crude instruments of that day comes within one mile of today’s actual measurement. 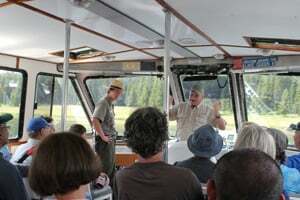 One of the most fascinating stories about Yellowstone Lake comes from a one-hour tour on the Lake Queen, a passenger boat departing Bridge Bay Marina daily from mid-June through mid-September. The boat heads out and around Stevenson Island, one of several islands believed to have never been trod by humans before the early exploration parties from 1869 to 1871. At one point in the middle of Yellowstone Lake, the Lake Queen turns in a circular pattern with the onboard ranger pointing out that the view of the shoreline is quite possibly the exact scene sighted by the first exploration parties—no buildings or improvements; untouched forests and mountains. The ranger also relates a bit of history, or perhaps, a tale embellished over time, about the remains of the SS E.C. Waters, its hull visible at the edge of Stevenson Island. 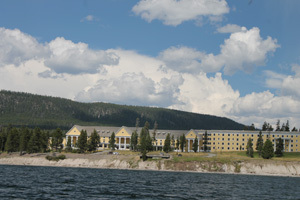 The story goes that in the summer of 1889 interest in a steamboat service on Yellowstone Lake grew, and a certain manager of the Lake Hotel, E.C. 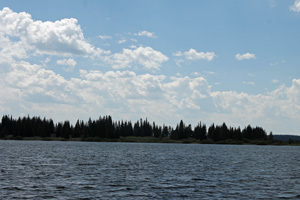 Waters, received a permit to put a boat on the lake under a franchise with the Yellowstone Park Association. Waters hauled the steel hull for a 40–ton steamboat into the park and christened the vessel, Zillah. 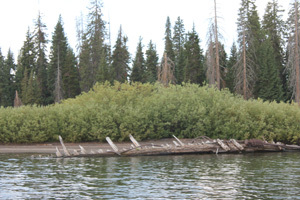 The remaining parts for the boat, originally launched on the Great Lakes in 1884, were transported in segments by train and wagon and reassembled at Yellowstone Lake. At that time, park visitors going to Yellowstone Lake Hotel, which had opened in 1891, had to be transported around the Park in horse drawn stagecoaches, enduring dusty, jarring routes that took at least a week. 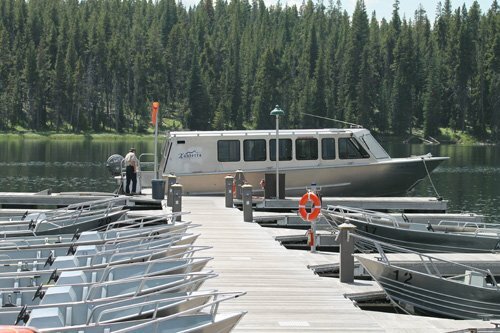 By boarding the Zillah, visitors decreased their arduous journey by at least 19 miles and allowed them comfortable travel across Yellowstone Lake from West Thumb Geyser Basin to Lake Hotel. For a while, entrepreneur Waters paid the coach drivers fifty cents for each passenger that boarded the Zillah. But then, Waters grew greedy, eyeing an opportunity to increase his profits. He determined to put animals on Stevenson’s Island, creating what he called a “zoo.” He fed the animals poorly with scraps from the hotel’s dining room. When he asked his passengers on the Zillah if they would like a stopover at the “zoo,” travelers eagerly assented. However, he charged each passenger an additional fifty cents to re-board his boat. Despite his unscrupulous behavior, Waters launched a second, larger vessel in 1905 and named it the E.C. Waters. Supposedly adequate for transporting 500 people, a capacity Waters claimed, park officials refused to license the 125-foot steamship as a commercial ferry. The $60,000 boat became an idle investment that soon lay abandoned on the east side of Stevenson Island. The story goes that in 1907, Waters was banned from entering Yellowstone National Park. At first, the abandoned ship endured the unrelenting battering of Yellowstone Lake’s wind, waves, ice, and snow. But when the ice broke up in 1921, the E.C. Waters was thrust onto Stevenson Island’s beach. In the mid 1920s, the steam boiler that drove the engine was removed and installed in the Lake Hotel to provide heat. The old boiler served the hotel for 46 years. However, the moored steamship fell into further ruin and became a warming shelter for winter skiers. According to Yellowstone historian Aubrey Haines, the E.C. Waters also turned into a prop for Jack Croney’s fish-fry business and the scene of brawls fueled with moonshine. In 1930, a group of rangers, under pressure to clean up the dilapidated eyesore, skied over the frozen lake to Stevenson Island and poured a can of kerosene on the bow of the boat. Apparently, they fired the wreckage without authorization of Yellowstone authorities, and according to Lee Whittlesey, another Yellowstone historian, one of the rangers was disciplined with a transfer to Ellis Island in New York’s harbor to serve the remainder of his career. Water’s ship, once stately and grand, was reduced to a blackened hulk, listing and sinking into the Stevenson Island sand. Today, the bleached ribs of the ship protrude from the shoreline. No plans to remove the wreckage from Stevenson Island are reported.